Paper shredders have these days become an essential machine in almost all offices and many homes due to their ability to destroy unwanted papers while saving time in the process. The machines come in three main types including: micro-cut, cross-cut, and strip-cut shredders. They all perform the same function except that they have varying levels of security. Microcut shredders are the most secured due to their ability to cut papers into tiny particles that would take donkey years to rearrange. Crosscut shredders are the next in line being able to cut papers into rectangular pieces. Their security level is not as high as the former but it’ll still take a whole lot of effort and determination to put the pieces back together. Stripcut shredders unlike crosscut and microcut shredders are not very secure. This is due to the fact that they cut papers into long strips and anyone who takes it upon him or herself to put the document back together would achieve success eventually. They are mostly employed in homes or offices that do not deal with highly confidential documents. As long as the document is converted to easily disposable pieces, they are okay. Their advantage is a very high speed, reliability and low price. If you are searching for an inexpensive paper shredder, then definitely consider strip-cut machines. Today, we’ll be reviewing 3 powerful strip-cut shredders in order for you to get all the information you need before setting out to purchase any. Ensure you carefully go through each of the features so as to make a choice that best suit your needs. Fellowes is one of the trusted brands in the market today when it comes to the production of shredding machines. The Fellowes Powershred 225i Jam Proof 20-Sheet Strip-Cut Commercial Grade Paper Shredder is designed to destroy documents that are not too confidential. They also come with a lot of features that’ll make your shredding operation fast and easy. The Powershred 225i is not a cheap paper shredder comparing to other models, but that is because it can handle more operations. Fellowes describes it as a commercial shredder and that is what it really is. The first and foremost feature to be discussed is one that happens to be out of this world. Its ability to swallow up a whopping 20 sheets at once, and continuous runtime. These are features that are hardly seen on other shredding machines. It instantly makes this unit standout from its competitors. Another important feature to be discussed is its advanced jam prevention technology. Machines that deal with a lot of papers has the tendency to experience jams at some points and this can be very frustrating. In order to avoid wasting time leaving your duty post to attend to paper jams, the Powershred 225I is designed with three advanced levels of jam protection. The first level involves a sensor whose job is to detect overfeeding by sensing the overall paper thickness and preventing the machine from running. The second level involves the machine increasing its power output so that it can destroy papers that folds or wrinkle while in the machine. It is also fitted with an auto reverse function whose job is to reverse the motion of the paper thereby clearing jams, before carrying ahead with its normal forward motion. The third and final level saves time and maximizes productivity by giving you instant feedback on the sheet capacity as you feed it into the machine. Safety is extremely essential when it comes to mechanical machines. The Powershred 225I is designed to take both the safety of the machine and your personal safety into consideration while in operation. To that effect, a safety sensor is fitted around the paper entry of the machine and its job is to automatically disable the shredder if it senses fingers around that area. Gone are the days when shredders operate noisily and the occupants of an office have to cope with such annoying noise. With Fellowes Powershred, you get smooth and silent operation; thanks to the ultra-quiet SilentShred™ technology. You can now have your shredder operating directly beside your desk and remain focused on your job like it’s just you and your computer in the office. Paying heavily for energy bills could impact on the profit being made by a company and for that reason, it is best to purchase machines that are energy efficient. The 225i is a machine that is efficient in all aspect. As much as it can destroy huge amounts of papers in a day, it is also designed to be energy efficient. The efficiency doesn’t only come when the machine is out of use. When in use, its performance is such that only minimal power is required to shred and when out of use, it goes into standby mode, and possible sleep mode after a while of idleness. Another feature which must not be forgotten is the high grade materials with which the machine is constructed. The 225i features solid steel cutters, a powerful motor, solid plastic, and other authentic parts designed such that their competitors are easily outperformed. Apart from the ability to shred papers, this unit is also capable of shredding CDs, DVDs, credit cards, paper clips, and even staples. Finally, a workhorse as this requires a waste bin with sufficient space or else, workers may become frustrated having to always dispose the shreds. Fellowes provides a 16 gallon capacity waste bin which is just perfect and capable of housing a very large amount of shreds. Since the bin is not transparent, a LED indicator on the machine is designed to come on as soon as the bin is full so that you don’t have to always pull it out to check. The AmazonBasics 8-Sheet Strip-Cut Paper, CD, and Credit Card Shredder is a low budget machine designed to handle small to medium range shredding tasks. It comes with two openings, one for feeding 8 sheets of paper at once for shredding, and the other for feeding creditcard and compact discs for destruction. Papers fed into the machine for shredding are generally cut into 1/4 inches strips at a rate of 9.84 feet per minute. Although not very secure, you wouldn’t expect more from a stripcut shredding machine. The following are some more features you could to enjoy from purchasing this low budget machine. The AmazonBasics 8 sheet shredding machine is capable of safeguarding your identity by destroying confidential documents such as bills, bank statements, mortgage statements, insurance packets, pay stubs, ATM receipts, and junk mails. The machine is best used for documents that are rendered useless once tampered with in any form. If on the other hand, the document is such that it contains vital information that you don’t want in the wrong hands, purchasing a microcut shredder would be your best option. As long as confidentiality is not an issue, this stripcut shredding machine could be the best shredder you have ever come across. It is affordable, fast, durable, and reliable. The machine can be set to operate automatically such that it springs into action as soon as its sensor detects any material that needs to be shredded. Shreds drop directly into the 3.2 gallon capacity bin just below the machine. The bin is not very large, but for a low budget machine designed for small to medium shredding tasks, it is just ideal. Another feature which is very important for shredding machines is the manual reverse function. Paper jams can be very frustrating especially when you have your hands filled with office work. The manual reverse function on this unit automatically clears paper jams by reversing the normal motion of the papers in the machine so that squeezed areas can be straightened out. The forward motion automatically resumes after the jam is cleared thereby completing a smooth shredding operation. The auto start and auto stop feature does much more than automatically turning on the machine when it senses paper input. The machine is designed to run continuously for two minutes after which the motor will have to cool down to prevent overheating. The auto start/stop feature ensures that this resting rule is obeyed by automatically turning off the machine after running for two minutes in order to protect the motor. The rest time is 15 minutes after which the machine can once again be operated continuously for another 2 minutes. Just as earlier stated, this machine is the cheapest paper shredder (or at least one of them) but efficient one. Designed for small business or home office, it has dimensions of 12.99 x 12.8 x 6.5 inches and weighs 6.2 pounds only. It can therefore fit conveniently under your desk enabling you to carry out your shredding operation without getting up from your sit. The Aurora AS810SD Strip-cut Paper, CD and Credit Card Shredder Basket is another low budget shredding machine designed to destroy important documents for you. 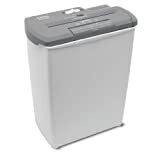 It’s an ideal choice for light duty shredding at your office or home. It can effectively cut full sized a4 sheets into 1/4 inches strip thereby putting your important documents beyond the reach of impersonators and other unwanted persons. The machine is designed with extra-sharp durable steel cutters capable of destroying 8 sheets of papers at once. It is also capable of destroying tougher items such as credit cards, CDs, DVDs, pins, and staples. The machine is fitted with a 4.5 gallon waste bin which is just ideal and capable of holding a good amount of shreds before disposal. An estimate shows that the bin will comfortably collect 100 sheets of shredded A4 papers. Its dimensions are 13 x 12.8 x 6.5 inches and weighs 7.2 Lbs. It can therefore fit perfectly under your desk for easy access whenever you need to shred. Its lightweight feature also improves its portability allowing you switch positions at will. You may choose to make it your personal companion by taking it home whenever you need to shred at home, and bringing it back to the office whenever you need to shred there too. The Auto start/stop feature on the machine enables it to turn off or on under various conditions. In an event that the machine is overfed with papers, it automatically turns off until the appropriate amount of paper is fed. It also has an overheat protection sensor which senses excessive heat on the motor as a result of continuous usage. The information is relayed to the Auto start/stop switch which then turns off the machine enabling it to cool down for some time before it becomes ready for the next batch of operation. Another feature which is very important in shredding machines is the manual reverse feature. It helps protect against paper jams by automatically smoothening rough papers in the machine so that the shredding operation always goes through uninterrupted. This would save you a lot of time at home or in the office. Noise is usually prohibited in most offices and even at home. The AS810SD is designed to be silent so that you can effectively proceed with your office work even while the machine is operational. The fact that the machine is small, coupled with its silent nature means you can place it directly under your desk and not be interrupted from your office work in any way. So there you have it! Three of the best strip-cut paper shredders you’ll come across in the market today. If your office is a very busy one and the shredder located centrally, the Fellowes Powershred 225i is unarguably your best option. This is because workers may have to queue up to perform their shredding operations in companies having medium or small sized shredders centrally located. A situation as this is not only unprofessional, but also leads to unproductivity. 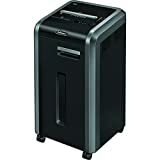 If on the other hand you need a machine just for light office shredding or home use, the AmazonBasics 8 sheet stripcut shredder is your best bet. It is extremely cheap, silent, and portable. The Aurora AS810SD is just as good as AmazonBasics but has just one-sixth of the customer reviews the later boasts of. This proves that AmazonBasics is preferred by customers and is definitely the best strip-cut shredder on the market. Below you can find the strip cut paper shredders best prices on Amazon.